Heat oven to 275°F. Line cookie sheet with cooking parchment paper or heavy brown paper. In medium bowl, beat egg whites and cream of tartar with electric mixer on high speed until foamy. Beat in 3/4 cup sugar, 1 tablespoon at a time; continue beating until stiff peaks form and mixture is glossy. Do not underbeat. On cookie sheet, shape meringue into 9-inch round with back of spoon, building up side. Bake 1 hour 30 minutes. Turn off oven; leave meringue in oven with door closed 1 hour. Finish cooling at room temperature, about 2 hours. In 2-quart saucepan, mix 3/4 cup sugar, the cornstarch and salt. Gradually stir in water. Cook over medium heat, stirring constantly, until mixture thickens and boils. Boil and stir 1 minute. Gradually stir at least half of the hot mixture into egg yolks; stir back into hot mixture in saucepan. Boil and stir 1 minute; remove from heat. Stir in butter, lemon peel and lemon juice. Press plastic wrap onto surface to keep it from drying out. Cool to room temperature. Spoon into meringue shell. Cover and refrigerate at least 12 hours but no longer than 24 hours. In chilled medium bowl, beat whipping cream with electric mixer on high speed until soft peaks form. Spread over filling. Refrigerate until serving. Store in refrigerator. 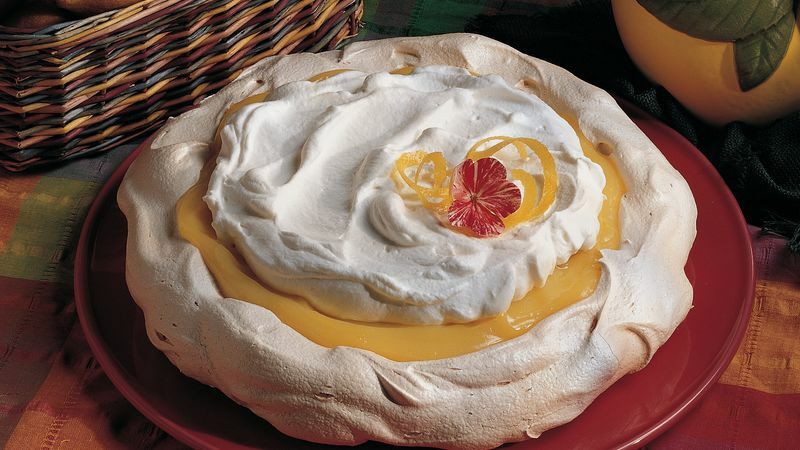 A schaum torte—or shaumtorten—is a classic Austrian dessert consisting of baked meringue layers filled with fruit and topped with whipped cream. Make it a Lime Schaum Torte when you use grated lime peel and lime juice for the lemon peel and lemon juice. Stir in 1 or 2 drops of green food color with the lime juice.